The short, brilliant life of jazz legend Leon “Bix” Beiderbecke, in a yeasty first novel by the veteran poet and nonfiction author (The Culture of Hope, 1995, etc.). 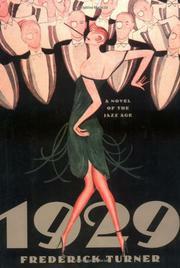 1929 is a richly detailed story of an age of excess, framed by the memories of aged Henry Wise (born Hermann Weiss), a survivor who had worked as road manager for Bix’s touring band in the late 1920s, and whose sister “Hellie” had, like Bix, been caught up in the period’s fractious, perilous energies. Initially, we see the somewhat opaque Bix as others see him: a “natural” musician of unprecedented gifts, a hopeless alcoholic since adolescence, adored and egged on by admirers, driven both by a manifest death wish and by his dream of composing “serious” music (“ . . . something to be remembered for, not that … other stuff”). Turner, whose inspiration by E.L. Doctorow’s Ragtime is everywhere apparent, creates some terrific set pieces, ranging from 1926 Chicago under the murderous thumb of “Scarface” Al Capone and minions like “Machine Gun” Jack McGurn (who’ll become Hellie’s lover, and nemesis) to Hollywood, where the Paul Whiteman orchestra (in which Bix labors) is engaged for the first all-musical talking picture, to the several drying-out facilities where Bix’s Iowa parents and concerned colleagues try, and fail, to divert him from his self-destructive path. There are notable cameo appearances by, among others, Louis Armstrong, Bing Crosby, Douglas Fairbanks Sr. (“Peter Pan with muscles”), Maurice Ravel (who, in a splendid scene, is taken to the Cotton Club to hear the Duke Ellington band), and “It” Girl Clara Bow (whose seduction of the probably virginal Bix raises the novel’s already elevated temperature several more degrees). And the elegiac final 50 or so pages have the soaring, surprising intensity of a honey-throated Beiderbecke solo. Rip-roaring, entertaining image of a bygone era that deserves Pulitzer consideration.